I really don’t bake cookies that often but today I wanted peanut butter, pretzels, dates, and chocolate (hello pregnant!) and couldn’t think of a better platform for that combination than a warm gooey cookie. Ok, that's not totally true. Usually I would just grab pretzels, slather them with peanut butter, and balance dates and chocolate chips on top. But I wanted to make a dessert for tonight anyway so why not kill two birds? These cookies came together basically as quickly as I could gather the ingredients together. Since the dough was soft I let it set up in the fridge for a bit. 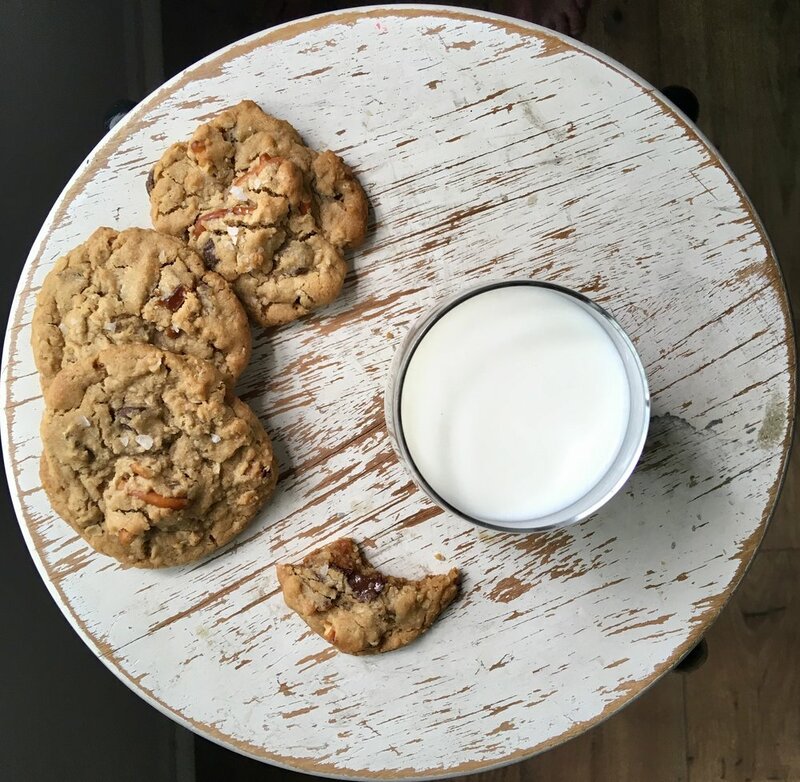 I read somewhere - can’t remember exactly but I wouldn’t be surprised if it was Joy of Cooking - that adding some blitzed up oats to chocolate chip cookies gives them a delightful chew, hence the added oats. Dates add a wonderful sweet contrast to the salty peanut butter and pretzels, but you can just do all chocolate chips. Beat butter and brown sugar on medium speed until light and fluffy, a few minutes. Add peanut butter, beat for 30 seconds. Add egg and vanilla and beat for another minute until well combined and smooth. In a small bowl, whisk together flour, oats, baking soda, and salt. Add to butter mixture and mix on low until just combined. Add chocolate chips, dates, and pretzel pieces and mix until just combined. You might just want to use a spatula or wooden spoon to ensure even distribution. Refrigerate dough until firm and easy to handle, about an hour. You can just spoon the dough directly on the baking sheet in cookie sized globs but they might spread while baking. Roll into balls of dough and flatten slightly. (If you do 1 inch of dough, you'll yield about 3 dozen; 1 1/2 inches will yield just about 2 dozen.) Sprinkle with sea salt flakes if you really love the added salty bite. Bake around 12 minutes or until browned around the edges and set. Let cool for a few minutes on the baking sheet then transfer to a wire cooling rack.